I recently attended a Sound Healing group meditation and with the beautiful blend of rhythm, rain, bells, chimes and healing bowls, I was transported to another plane where I unexpectedly experienced another connection to Lemuria. I’ve been intuitively sensing the presence of Lemurian energy around me for some time but in recent months I’ve been seeing the impression of the same sculptural image in and around my home. 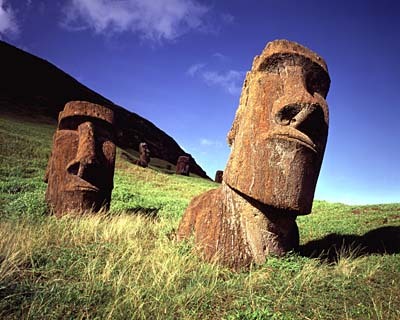 When I stumbled upon an article, I realized I was seeing something similar to Easter Island and that some historians link the origins of Easter Island with Lemuria. And now with the help of the primal sounds of music, voice, chimes and healing bowls, this same sculptural image has appeared at the end of a deep meditation. As I became aware of the image it began to dissolve but the imprint of Lemuria was immediate. In a similar experience to my Kundalini Awakening several years ago, the energy centred on my Heart Chakra and felt as if a deluge of intense Light and Love had completely filled me, flooding me with indescribable feelings of awe and bliss and leaving me with a racing heart and tears. Later that night I was awoken in my sleep by a strange knocking and thoughts of someone wanting to come in. Six weeks ago I sensed my Lemurian Seed crystal calling out to me and 4 weeks ago I could feel the pull of their energy from faraway places. Now it seems the gate of communication has opened and it is no coincidence it’s happening at this time with the recent cleansing from the Sun opposition to the Pleiadian Alignment and the potent energies flowing between Eclipses. What the Lemurians bring is overwhelming Love and their Sacred desire to share Knowledge and Healing. Their Essence is very peaceful and feels strongly connected to water and has left me with the message that being near or in water is how to prepare myself to be open and ready to receive more.